Today, as we celebrate the feast of the Transfiguration, we come to a high point on the Church’s liturgical calendar. This is a celebration which is fixed on the Church calendar, thus, in celebrating this most august feast today, we temporarily jump out of chronological order in our examination of Matthew’s gospel by a full three chapters. I note this for two reasons; first, to maintain before us the proper contextual perspective; and secondly to alert the reader that while we are out of the chronological order established by the sacred author, the Holy Spirit ensures that despite this seemingly nonsensical approach, all has indeed worked out for our good (cf. Rom. 8:28). For today’s celebration, among many other things, gives us a prophetic glimpse of the underlying reality which our Lord has gone to such lengths to portray to us verbally through the parables concerning the Kingdom of God which we have heard over the last three Sundays. Said differently, this feast has a recapitulatory quality to it; i.e. in a sense it gathers up and explains all that has come before it such that by witnessing the transfiguration, we witness the truth underlying the parables, and beyond this witness the truth underlying all of history. The recapitulatory nature of this feast gives it added depth and complexity; this is seen in the fact that several historical strands can be tied together by it, serving for each of them as a point of reference. Said differently, as we will see, the occasion of the Transfigurations was prefigured in various events of Jewish history; demonstrating how the God of Jesus Christ had been walking with the human family all along, continually instructing them and pointing them to the end for which they had been made and gathered, an end revealed most eloquently in the life of Christ. That said, the fact that this event is so profound should immediately cast from our minds any illusion that our consideration of it will be exhaustive. 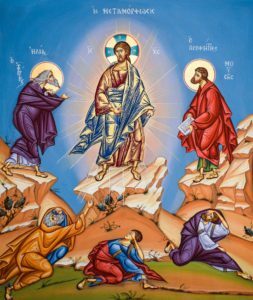 For as we set foot on the mount of the Transfiguration, we in effect set foot on holy ground; we step before the presence of the ultimate reality we call God. Therefore, our contemplation of the Transfiguration is the contemplation of heaven; it is a glimpse of the beatific vision rendered tolerable for fallen human eyes in order that it might serve the same function that all such encounters with God serve for us, whether that encounter take place in creation, in the Scriptures, or in the sacraments; i.e. they serve to bolster our faith and provide our hope with surer footing, that the joyful message embodied by Jesus Christ may come alive within us. This recapitulatory quality confronts us with the opening words of the gospel account which set the narrative stage for us if you will. The opening verse reads: “And after six days Jesus took with him Peter and James and John his brother, and led them up a high mountain apart” (Matt. 17:1). The Lucan account is contextually identical, but adds a detail of importance for our understanding of this episode, i.e. Luke tells us that the Jesus had taken Peter, James and John up the mountain with him to pray (Luke 9:28). This detail provided to us by Luke connotes a liturgical dimension, for what else is prayer than to put oneself in the presence of God, which is precisely a “liturgical” action. By doing so it gives us direction into where we ought to look to find our proper context. For our purposes it immediately begs the question, six days after what? We find further strands to gather up if we turn to consider the two individuals who appear alongside Christ amidst his transfiguration, Moses and Elijah. These two monumental figures in the history of Israel, and in turn, our own history, broadly speaking represent all of the Law (Moses the giver of the Law) and the Prophets. That they appear now with Jesus signifies for us something that was of the utmost importance for the early Church and must remain so for us today, i.e. that the Old Testament or Hebrew Scriptures, because inspired by the Holy Spirit, speak of the activity of the same God who became Incarnate in the New Testament, Jesus Christ. For example, Irenaeus of Lyons (130-202AD) wrote that the Son of God’s Incarnation, death, and resurrection both fulfilled the Law and vindicated the prophets (Against Heresies, Bk 4.2.6); and in a similar vein Origen (185-254AD) wrote that “the beginning of the Gospel…is nothing but the whole Old Testament” (Commentary on the Gospel of John, Bk 1.14). Thus both would pass on to us the traditional understanding that the true depth of the Old Testament could only be seen in light of Christ, who was both the key to unlocking their richness (Origen, On First Principles, Bk 4.6) and the treasure hidden therein (Irenaeus, Against Heresies, Bk 4.26.1). Taken separately, the figure of Moses most readily serves as a parallel to the episode of the Transfiguration. For instance, both take place on a mountain, and, Moses, like Jesus, goes up the mountain with three companions, Aaron, Nadab and Abihu (Ex. 24:9); both events take place on the seventh day and both portray God as speaking out of a cloud (Ex. 24:16); finally, both speak of this radiant glory of God made manifest, the Exodus account relating that “the appearance of the glory of the Lord was like a devouring fire on top of the mountain…” (Ex. 24:17). Moreover, after Moses came down from the mountain where he had met with God, “the skin of his face was shining,” a direct parallel with our Lord’s Transfiguration, and a phenomenon which draws similar reactions from both the people of Israel and the disciples, i.e. one of fear (Ex. 34:30; cf. Matt. 17:6-7). This illumination of Moses’ face would happen whenever he entered God’s presence and conversed with him, providing an added connection to the detail provided to us by Luke that it was in the context of prayer that our Lord was transfigured (Ex. 34:33-35). That said, there is one very important thing to note when considering this similarity which will be important when we turn to consider how it is that we fit into all of this further on, and that is that in the case of Moses “the light that causes him to shine comes upon him from the outside, so to speak. Jesus, however, shines from within; he does not simply receive light, but he himself is light from light” (Joseph Ratzinger, Jesus of Nazareth: From the Baptism in the Jordan to the Transfiguration, pg. 310). Turning now to consider briefly the body of work represented by Elijah, we may consider the words of two prophets. The first is Daniel, from whose work our first reading comes to us today. Although Daniel’s work is considered apocalyptic, there is nevertheless a prophetic element to the visions seen therein, most especially in connection with the transfiguration. As we heard in our first reading, Daniel describes a vision of the “Ancient One” taking his throne, “his clothing was white as snow, and the hair of his head like pure wool” (Daniel 7:9). He goes onto add that he “saw one like a Son of Man coming with the clouds of heaven. And he came to the Ancient One and was presented before him. To him was given dominion and glory and kingship, that all peoples, nations, and languages should serve him. His dominion is an everlasting dominion that shall not pass away…” (Daniel 7:13-14). If we read this in light of today’s gospel we note several things. First, we have two figures, the Ancient One, and the Son of Man; who in today’s gospel appear as the Father and the Son. However, notice how in the gospel, the Son has the appearance of the Father as envisioned by Daniel, signifying to us their inseparable unity. Notice too please that in Daniel’s vision, the Son of Man comes in the glory of his Kingdom, to rule over all things. We find a direct connection to today’s gospel when we consider that immediately prior to the section read today, Jesus had told his disciples that “there are some standing here who will not taste death before they see the Son of man coming in his kingdom” (Matt. 16:28). While some had wondered if Jesus meant that some of them would not deny before the resurrection, in light of Daniel it becomes quite obvious that this glimpse of heaven given to Peter, James and John is the kingdom Jesus had spoken of. There is one more major prophetic figure who receives a twofold vindication in the Father’s declaration that this, in fact, was his Son who was transfigured before him, and that is Isaiah. The tradition of the much maligned prophet had once foretold of a Suffering Servant of God, who would be “wounded for our transgressions, crushed for our iniquities,” upon whom would be laid the “punishment that made us whole” (Isaiah 53:4-5). The Lucan account gives the Prophet’s message its vindication, for there we are told that as Moses and Elijah appeared with Jesus, they “spoke of his exodus, which he was to accomplish at Jerusalem” (Luke 9:31), quite obviously referring to the crucifixion. This connection makes explicit to us that which was expressed by John, that the crucifixion was in fact, the ‘hour when the Son of man was glorified’ (John 12:23). Thus, as mind blowing as it sounds, we could indeed say that what we see in the Transfiguration is the reality of the Crucifixion; i.e. that in a fallen world, the glory of God’s complete and selfless love is seen most clearly on the cross. If we take this one step further, and recall the words of St. Irenaeus that “the glory of God is a living man; and the life of man consists in beholding God” (Against Heresies, Bk 4.20.7) it becomes apparent that the Son of Man, stretched out upon the cross and gazing heavenward, the breath of life nearly completely drained from him whispering, “Father, into your hands, I commend my spirit” (Luke 23:46) is the most fully alive human being this earth has ever given witness to. The second strand of vindication experienced by Isaiah in the Transfiguration is found in St. Augustine’s reading of the event. Augustine saw the transfiguration of the clothes of Christ as a figure of the transfiguration of the Church (Sermon 78.2). We can recall that Isaiah had once said that “in days to come the mountain of the Lord’s house shall be established as the highest of mountains, and shall be raised above the hills; all nations shall stream to it. Many peoples shall come and say, ‘Come, let us go up to the mountain of the Lord, to the house of the God of Jacob; that he may teach us his ways and that we may walk in his paths’” (Is. 2:2-3). Here then, in the transfiguration, we see the transfiguration of the Body of Christ, the Church; a reality proleptically realized whenever we are gathered to our Lord in the opening of the Scriptures and the Breaking of the Bread (Luke 24:32 & 34). My friends, not only is the glorification of the collective Body of Christ, the Church, a reality which already has begun and awaits its completion, so too the glorification of each individual member of His Body. This process of glorification which we might refer to as sanctification or deification begins with our passing through the sacred waters of baptism. There, as we are submerged and rise again three times, united to the Incarnate Son in his death, resurrection and ascension, the fuel that is the imago Dei which is stamped upon our nature is ignited into flame by the Holy Spirit. The Orthodox Saint Nicholas Cabasilas calls Baptism illumination, “since it confers true being it makes men known to God, because it leads to that light it removes from darkness and wickedness” (The Life in Christ, Bk 2.2). The very symbols we use within the rite itself communicate to us this transfiguration. For instance, upon clothing the newly baptized with a white garment, the minister says to him or her “you have become a new creation, and have clothed yourself in Christ. See in this white garment the outward sign of your Christian dignity…bring that dignity unstained into the everlasting life of heaven.” Next, the flame from the Easter Candle, which symbolizes Christ, who is the “true Light who enlightens every man” (John 1:9) is transferred to the newly baptized’s candle, signifying this illumination. And finally, there is the prayer over the baptized’s ears and mouth in order that they might come alive to proclaim the good news of Jesus Christ which gives hearing to the deaf, sight to the blind and life to the dead. Thus, in a very real way, the feast of the Transfiguration is the feast of our transfiguration. Therefore, as we gaze upon the Transfigured Christ, we gaze as it were, into a mirror which displays to us the completion of our sanctification begun in baptism. However, we must remember that our glory, like that of Moses, is always derived from outside, i.e. it does not come from ourselves, but from God, and that in order to live ever more glorified lives here and now, we like Moses, need to return time and again into the immediate presence of God through contemplating the Scriptures and participating in the liturgy of the Church, most especially that of the Eucharist, which most perfectly unites us to him who took on all that we have in order to bestow upon us all that is his. Lord Jesus Christ, you clothed yourself with the humility of human nature in order to share with us the glory of the divine. Grant us the grace to live every moment in the unsullied glory that became ours in the waters of recreation, so that as living flames, we might transfigure the world by dedicating it to the life you share with the Father and the Holy Spirit, one God, forever and ever. Amen.